Are you running into Storage issues on Salesforce? Are you running into Storage issues on Salesforce? Make sure you are on Marketing List Package Version 1.38 today! The new 1.38 package makes sure that Campaign Member History is populated only if "Campaign as List" feature is selected in Step 1 of a Sync Profile. Note: Be sure to check "Do not save a copy of this package's data after uninstall" option when uninstalling the package? If you didn't check that option, you will need to wait 48 hours before Salesforce permanently removes the package data. If you are here then you’ve probably been having a bit of trouble your set-up on CRM Checkbox Fields to your Mailchimp Groups with SyncApps, right? Your landing page (which is a Mailchimp contact form) has a lot of checkboxes. The checkboxes are handled in Mailchimp as Groups. Wanting to sync these Groups exposed on our MailChimp form directly from the checkboxes and sync these subscribers to Salesforce? Yes! 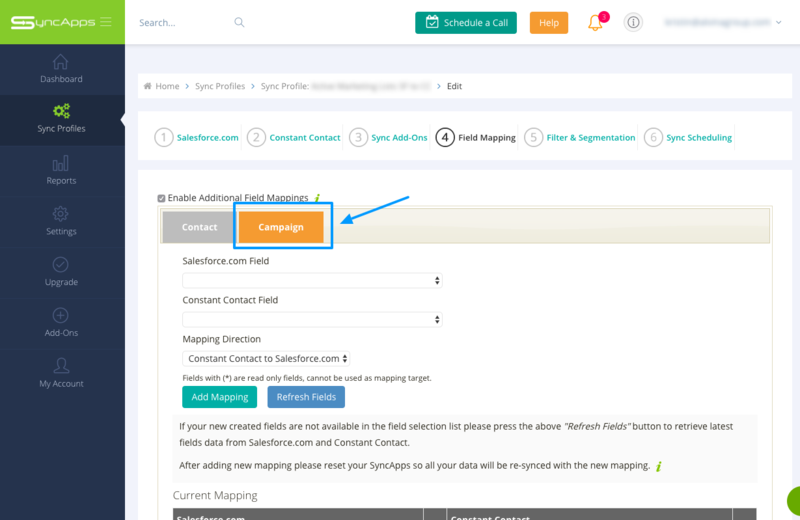 you can also create each of your Groups (checkboxes on your Mailchimp form) as also checkboxes on the Lead or Contact record in Salesforce and then set up in your Sync Profile to match them in Step 1 of your integration in SyncApps. Updating subscriber and grouping data from Mailchimp for Salesforce is done in real-time (using webhooks). So Sync on Demand or Sync Scheduling is not needed for this action to take place. To get started using Checkboxes feature please see your Dashboard > Add-Ons to enable this feature on your integration. Checkbox Fields for Segmentation will take precedence over any Campaign/List selection in Step 1 of each Sync Profile once selected. 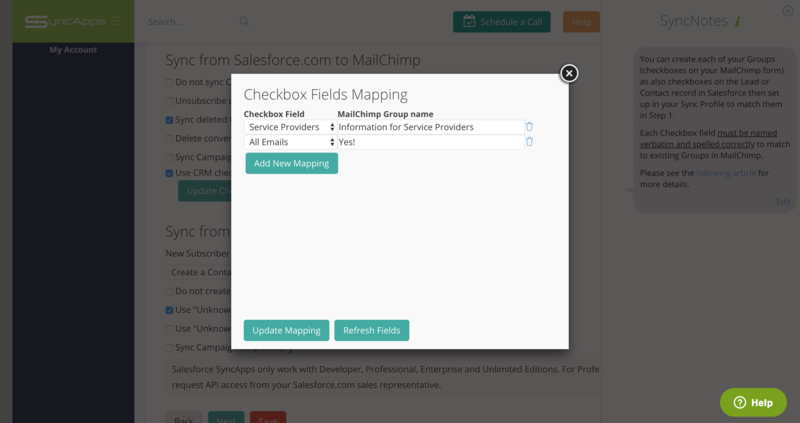 Note that for Checkbox mapping, the Group information from Mailchimp should also be synced to CRM checkbox if properly configured so there is a way to accomplish your flow from a Mailchimp form to Salesforce requirement today. Mailchimp Segmentation Method in Step 2 must use Mailchimp Groups in the drop-down menu, and not Tags when using our Checkbox feature yet you have selected our newest feature Tags. Groups are interdependent to our Checkbox fields feature and Tags are not. Group Title - The Groups in Mailchimp must be in one Group title and also named "Group Title to Use" in the Sync Profile. 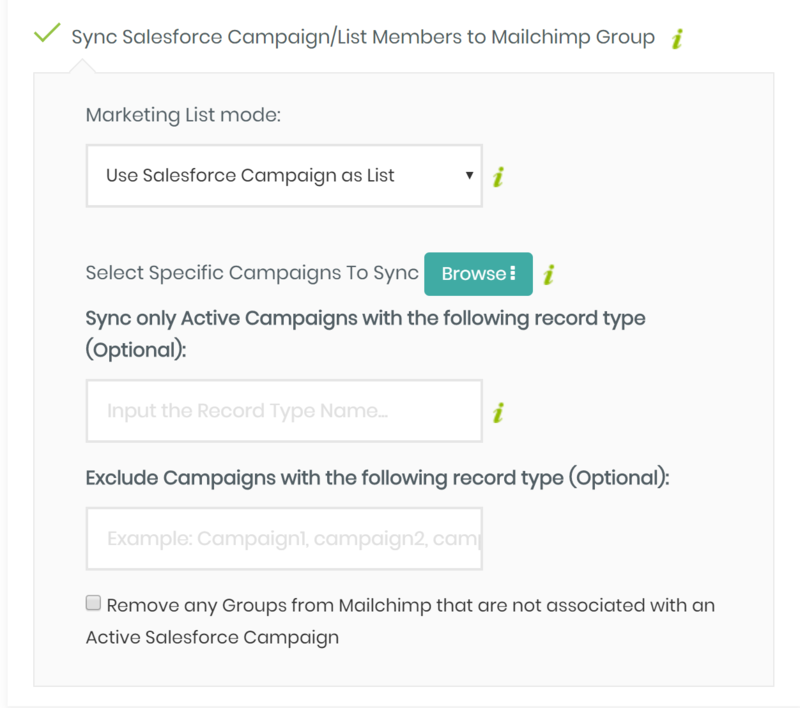 If you have existing records in Groups in Mailchimp that need to be synced back to Salesforce Checkbox fields then ask our support about the feature to sync Mailchimp Groups to CRM. Example of Mailchimp Group members which are preexisting and can be synced back into CRM Checkboxes using your SyncApps integration. How do I sync Salesforce Person Accounts to Marketing Automaton list(s) or Group(s)? 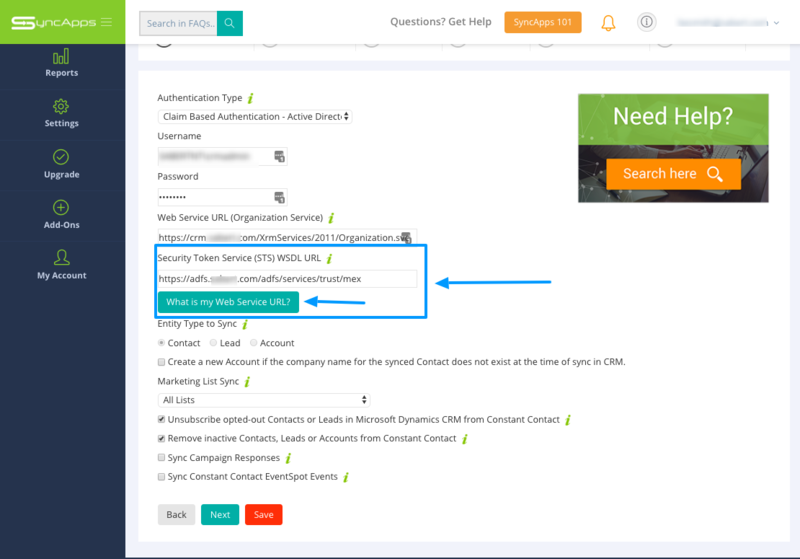 Are you having trouble Salesforce Person Accounts to Constant Contact lists? Below is a use case from one of our subscribers that might have the same snag as you're on. I found a thread in the Cazoomi Support which has the same question I do, but my integration is Salesforce to Constant Contact. I can't Enable Additional Field Mappings - not all of them seem to be showing up. Please advise. Thanks for the note and can you share the fields and what object they are on? In our Person Accounts, we have a field called Relationship with pick-list values. This is how we'd like to sort. Thanks, and I think the best approach is not field mapping as your SyncApps is pulling from Salesforce Person Accounts, and in which you could select members based on the Relationship drop-down list using the Marketing List feature. Now that you have 1 Sync Profile using Marketing Lists, feel free to set up individual Marketing Lists for each Person Account criteria for the drop-down list called Relationship. Each Marketing List in Salesforce will auto-create the list in Constant Contact, as well as populate those members into the Master List you have specified in SyncApps setup screen for Constant Contact. 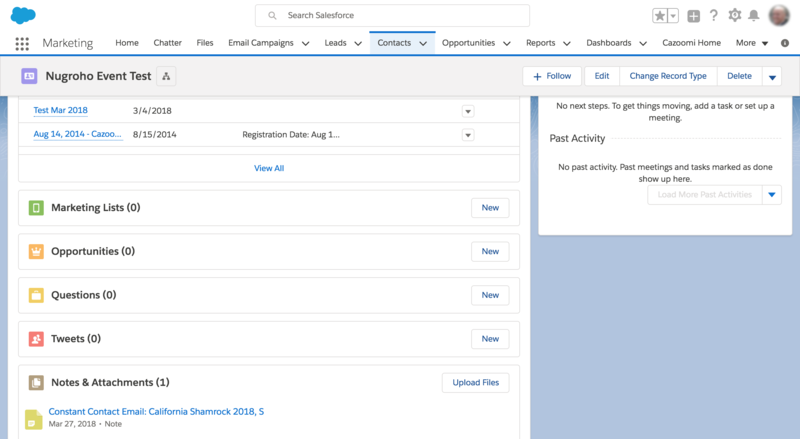 If you are on our free trial, you can also try out integrating Person Accounts using either Campaign in Salesforce synced to Lists in Constant Contact or using our Marketing List feature as well. Both work the same way as Person Accounts can be added to either a Campaign or Marketing List in Salesforce. Check out our in-depth video below by our integration experts! Hey there, are you having trouble resolving this Error code: 4834 while generating your Zoho CRM API Authentication Token or just trying to update existing integrations with a new token? 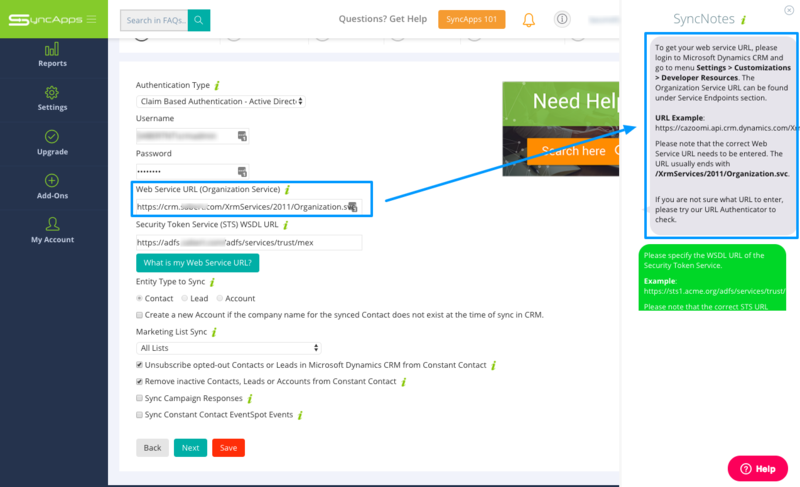 Sample Response for Zoho CRM Auth Token you will get after completing the steps above. 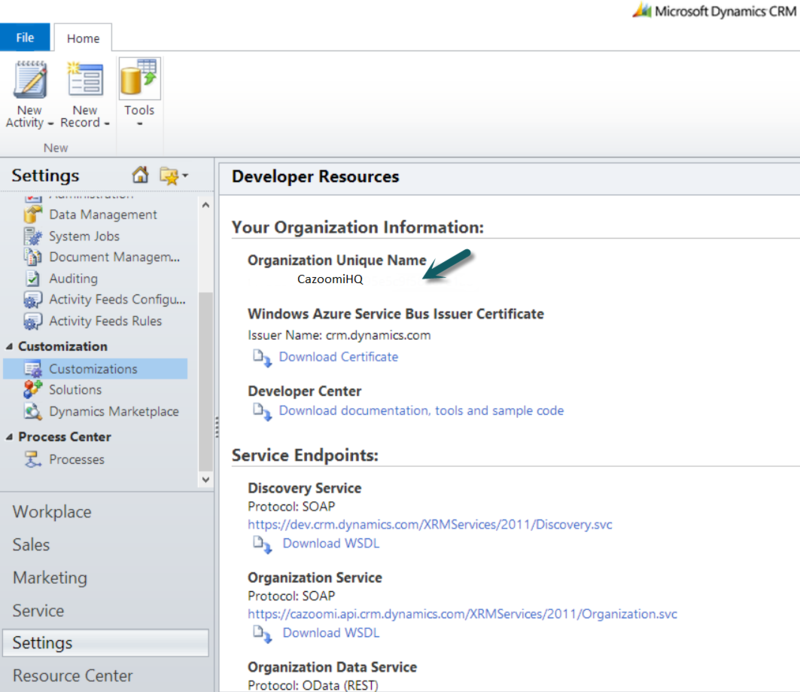 Head back to your integration and in Step 1 reenter the new Authentication Token. Note: If using multiple integrations then use the same Zoho Authentication Token in all Sync Profiles, Save, then Resync. 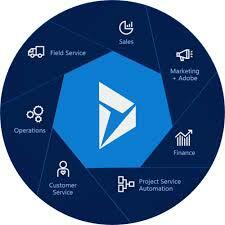 Select users for whom you want to allow CRM access only through certain specified IPs. 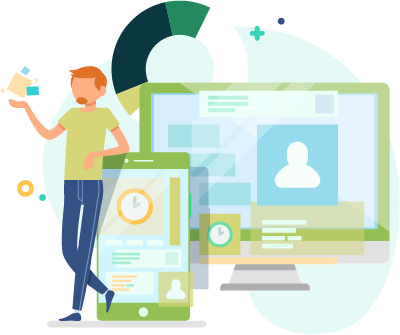 Hey there, want to set up automation in your CRM or eCommerce platform to send emails in your marketing automation solution when you create new leads or other criteria? Well, you’ve definitely come to the right page! Are you filtering from MINDBODY, Dynamics CRM, Salesforce, Highrise CRM, NetSuite, Zoho CRM or others that are only syncing those CRM records who meet specific criteria? 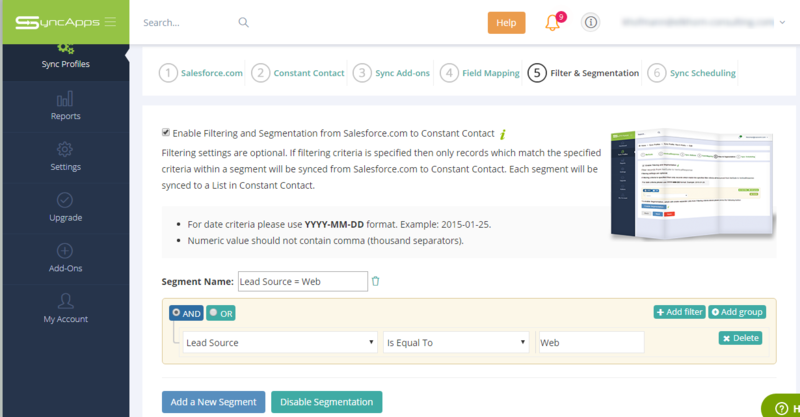 If it happens that you are using Salesforce, test out this way on our trial using a subset of your database as shown here. Also, filtering specific records into CRM from your Marketing Automation solution like Mailchimp, Constant Contact, Pardot, Salesforce Marketing Cloud, Delivra, Klavio, Drip, and others? 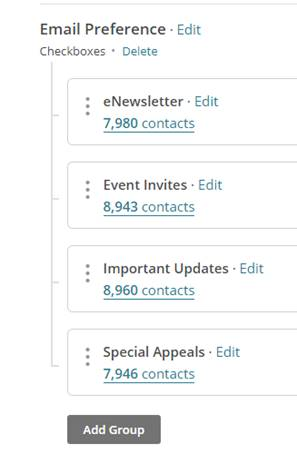 If you want to filter into your CRM, this feature is also available for use cases where what you want to happen is that, any matching contact that opened or clicked, an active campaign within the last sync cycle (set to 24 hrs), would be updated in CRM with an entry in the Campaign Response field, or added to CRM if they aren’t. Filtering is one of our most subscribed features which can be found in Step 5 of your setup. Note: If using Filtering & Segmentation feature and need to automatically remove records from your Marketing Automation solution once the records do not meet your criteria any longer please also grab the Add-On for this feature explained here. Please see below an example of how to filter records from Highrise CRM to Constant Contact. Filtering settings are optional. If filtering criteria are specified, then only records which match any of the filter criteria (AND/OR) within a segment will be synced from Highrise to Constant Contact. Each segment will be synced to the Master List in Constant Contact. Check it out in your SyncApps dashboard today! 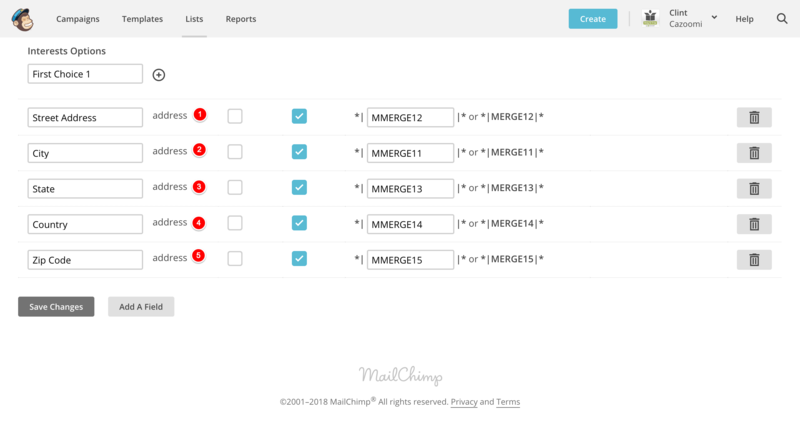 The existing Lists in Mailchimp will be the Audience for each Sync Profile. In this example each profile uses an existing List, no new List is created in Mailchimp. If on a Free Trial best practice is to place Leads or Contacts into a CRM Campaign, Saved Search or Marketing List then use Filtering, and then sync, after the syncing process you can then see how it works. 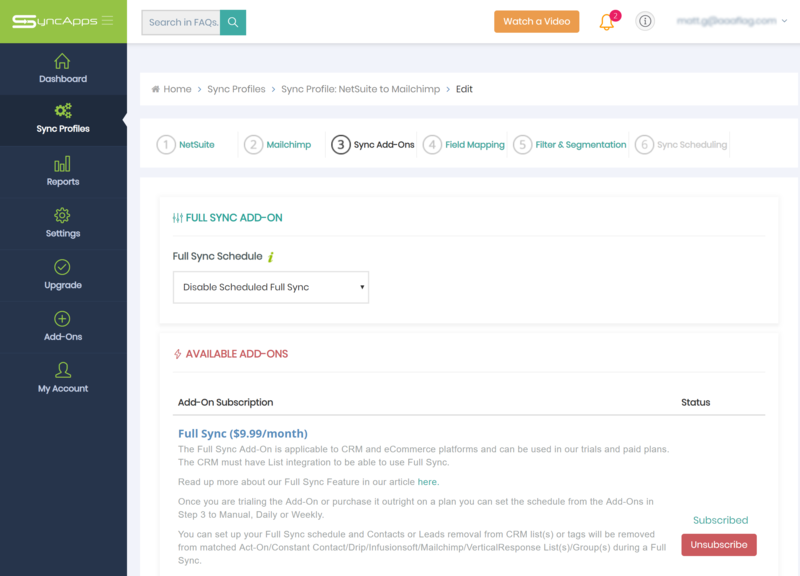 If you're on a Free Trial, please note that we sync unlimited records to match your criteria so best practice is to place at least 100 test Leads or Contacts into a CRM Campaign, Saved Search or Marketing List then use Filtering, and next sync, then you can see how it works. 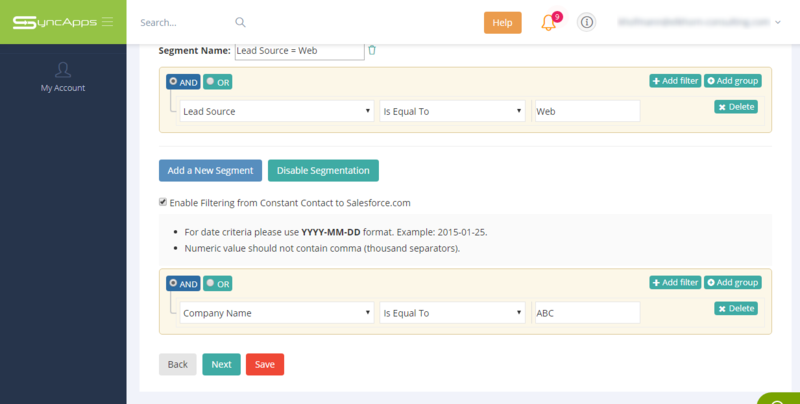 To rectify this issue a Campaign in Salesforce is needed to test out the Filtering feature. 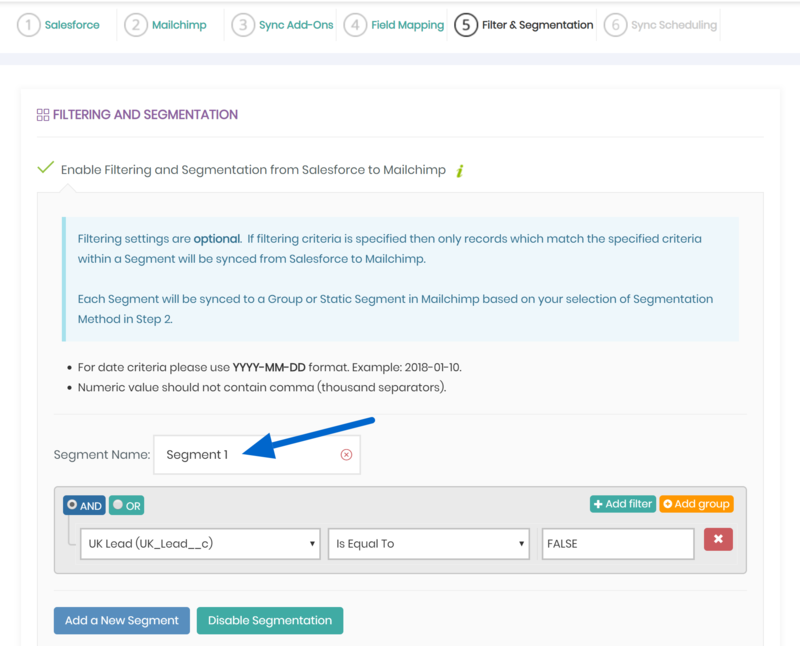 To test out this feature is super simple by just setting up a Salesforce Campaign, select it in Step 1 of your Sync Profile, then using it with 100 records to test your Filter against in Step 5. Once testing is completed next remove the Campaign/Saved Search/Marketing List checkbox in Step 1 and then keep the Filter on a paid plan which then does look at all records and Filters based on your criteria. Greetings! I work for "Company X" in El Salvador, Central America. At the end of last year, we finished the integration of Salesforce and Constant Contact (trial version). We updated 11,536 records which means the update included all Company X global database. However, as we are a country office we need access only to our contacts in El Salvador. Our technical team in headquarters took a glance at the app in Salesforce and unfortunately there is nothing on our end that we can do to stop the app from editing other Contacts. To meet your requirement, you will need to use our Powerful Filtering and Segmentation Feature as seen in the screenshot below. The filtering criteria are set to Country > Is Equal To > El Salvador. 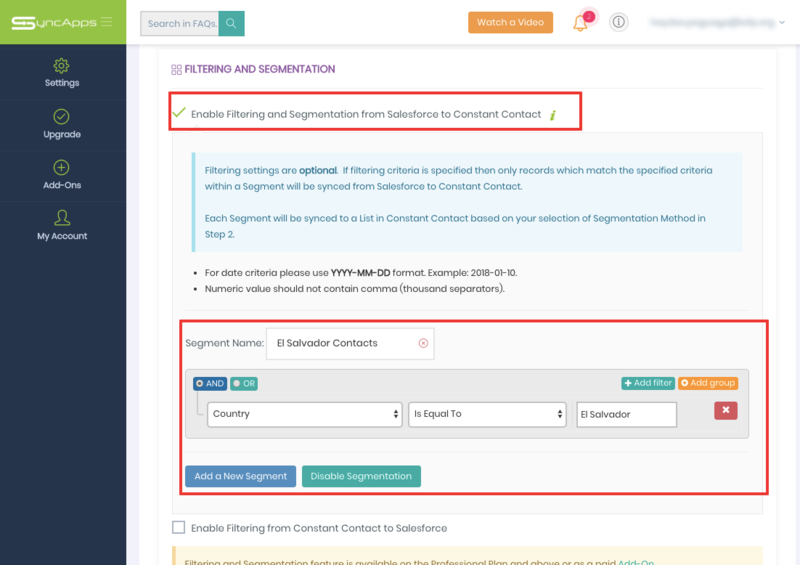 This means that only the Salesforce Contacts with country El Salvador will be synced to Constant Contact and will be placed under the automatically created List( Segment Name) El Salvador Contacts. Once this is done then please hit save then Reset sync Process and resync so that the new configuration/changes will be applied in the next sync. See our Wednesday Walkthrough replay here! Check out our Subscriber’s Story below on how SyncApps helped them save 100s of hours per year in the manual effort! Here is one of our most powerful features on this integration explained in detail. Also, many of our subscribers on Pipeliner integrate to save time and resources so based on our metrics internally, and with our vendors, the average company can save 13 days a year in manual efforts. To see more of our cool features just head here to signup for our free trial which includes 10+ pages of SyncNotes to explain all the cool features you might need for your company. SyncApps uses Dynamic Discovery Methods so you are all set with us. If you have more concerns with the NetSuite Dynamic Discovery Method then please reach out to our24/7 Support Team today! Hello there, thanks for dropping by! If you’re here, then probably you are wanting to sync Mailchimp Hard Bounces to Salesforce. You can do a few simple steps to set this up successfully! Please note that if using Campaign Responses, then the field called Bounces will automatically come back into the custom field the integration creates called "Bounces." This applies to all marketing automation solutions we support today. If "Bounces" goes from 0 > 1 > 2, then you can assume it is a Hard Bounce from the Campaign History metrics. 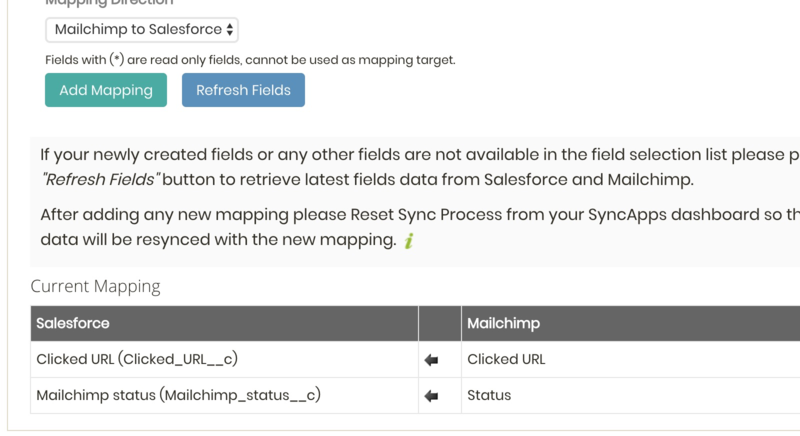 Mailchimp's API also supports mapping back "Hard Bounce" to Salesforce. You can see this in Step 4 of your Sync Profile. 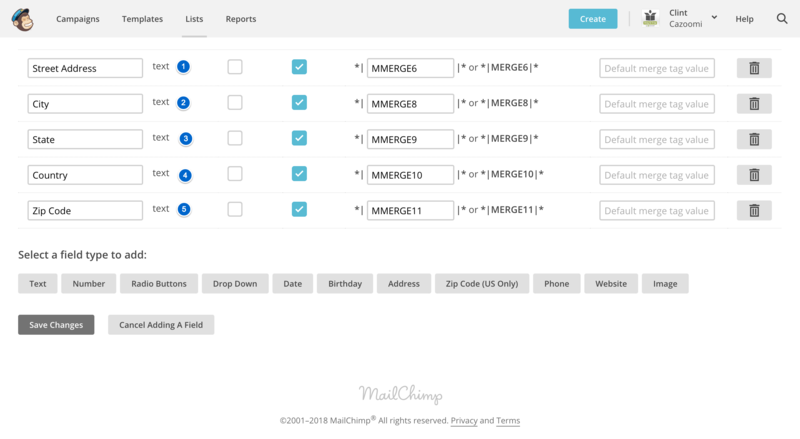 You can use a simple CRM Checkbox field or Hard Bounce custom field to map from the Mailchimp *Hard Bounce field, and that’s it! This error is caused when your role in Salesforce is set to be a "Non-Marketing User". To overcome this error, log in to your Salesforce account and change the permissions for the user in Salesforce which is using SyncApps by enabling the Salesforce "Marketing User" on the user's record. Please let us know if the error still persists and we will help you troubleshoot 24/7. Hi, there! Thanks for dropping by! Our Checkbox Field Feature is now available for Mailchimp for Zoho CRM integrations! *Available as a paid Add-On in Basic and Professional Plan. However, this feature is included in our Enterprise Plan. Using our Checkbox Field feature lets you control which CRM Contact or Lead record can be integrated into your specific Mailchimp Group(s). Also, you can use the Mailchimp Update Profile form to control checkboxes back to CRM for ultimate control. To have this option exposed in Step 1 of the Sync Profile, our Add-On purchase is needed. 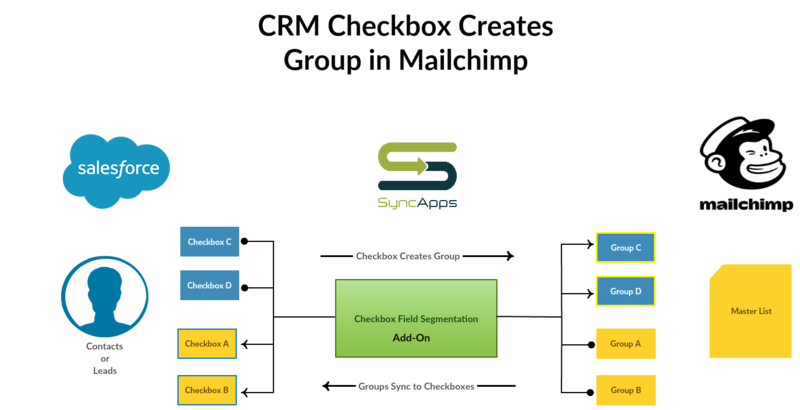 Please note that using Checkbox Fields for Segmentation will supersede Campaign or List selection in your Sync Profile in Step 1. Mailchimp Segmentation Method in Step 2 must use Mailchimp Groups in the drop-down menu, not Tags when using our Checkbox feature yet you have selected our newest feature Tags. Groups are interdependent to our Checkbox fields feature, and Tags are not. The Groups in Mailchimp must be in one Group title and also named in the "Group Title to Use" in the Sync Profile. Checkbox field feature FROM Mailchimp to Zoho CRM, this will only take effect on new records. For existing records, you need to update Zoho CRM Checkbox fields, then export these records and import into CRM to make sure the Checkboxes are updated in CRM first thru CSV's. 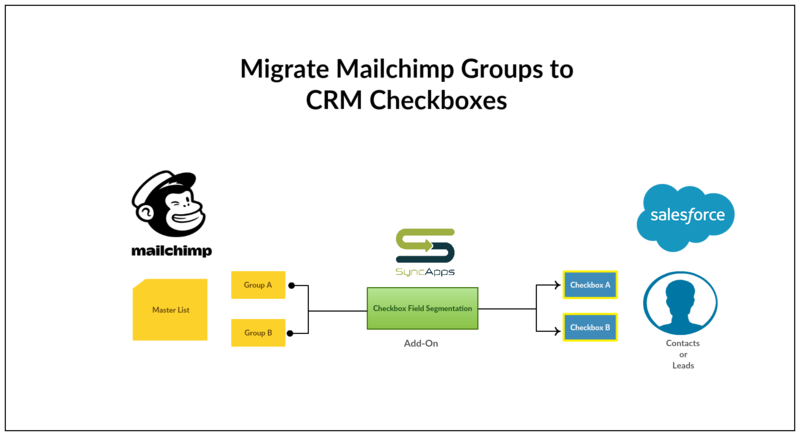 Example of Mailchimp Group members which are preexisting and need to be exported into CRM first then Checkboxes will work moving forward using your SyncApps integration. If you encounter any snags, don't hesitate to drop an email to our 24/7 Support team. We'd love to help you out. Sync Person Accounts from Salesforce to Constant Contact? You happen to use Salesforce and need to see the Marketing Metrics on the Account Layout? Great! As this is super simple! Just select Account as the Object type then select the option “Campaign Response for Person Accounts”. 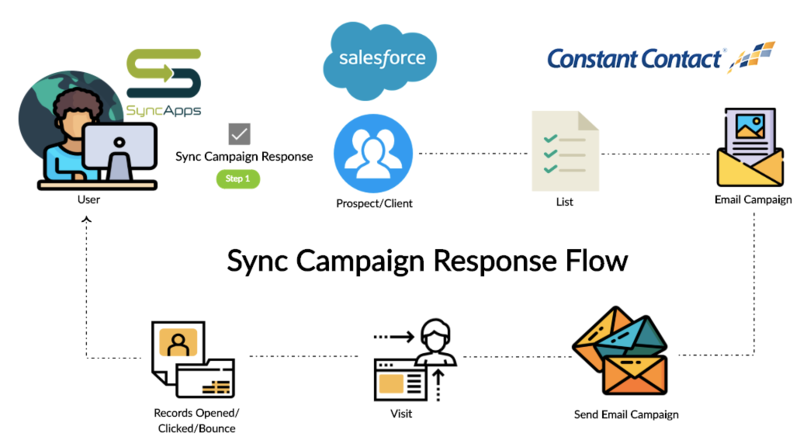 If Sync Campaign Responses is enabled on your Sync Profile, then custom fields in Salesforce will be automatically created for placement on the Campaign Members (Campaign History) object to store email marketing metrics such as the number of opens, clicks, and bounces. 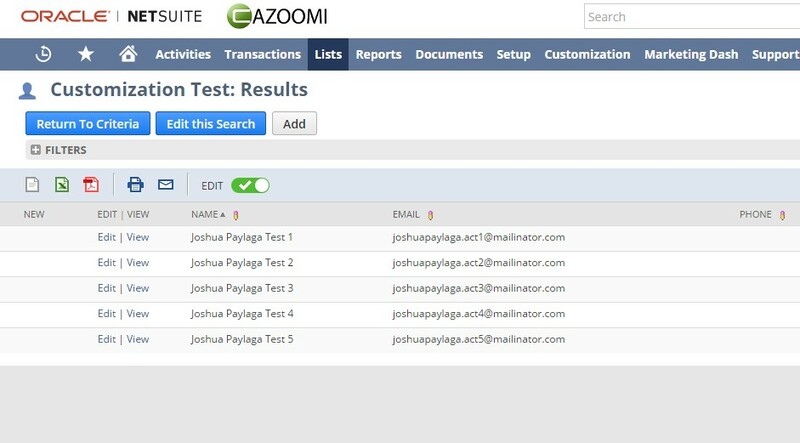 On a 2 weeks free trial, best practice is to create test Campaigns and test records to sync. After creating a Sync Profile with Account as the Object Type. 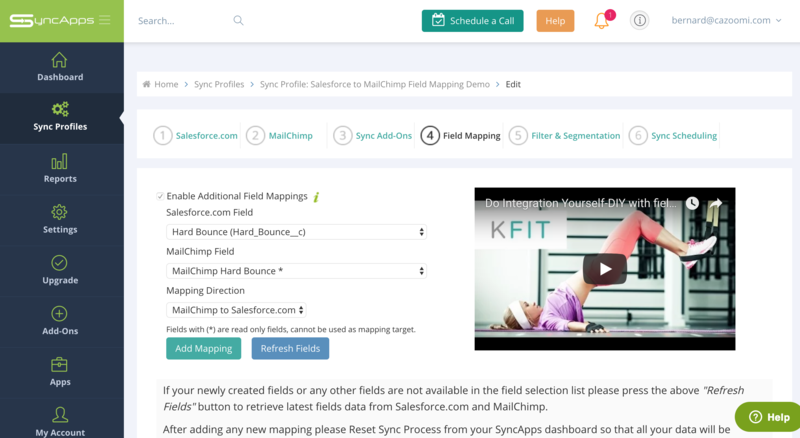 Check Salesforce layouts to make sure all fields created by SyncApps are dragged into the layouts for your Salesforce organization. Do your requirements call for syncing Checkboxes from Pipeliner records to Constant Contact, Mailchimp or Act-On? By using our powerful Filtering and Segmentation feature, this can now be achieved! Head to Step 5 of the Sync Profile then set the criteria for Filters to (Name of Checkbox) and select the operator to "Is True (Checkbox Checked). Once the changes have been made, then please press Save, then Reset Sync Process and Sync Now. 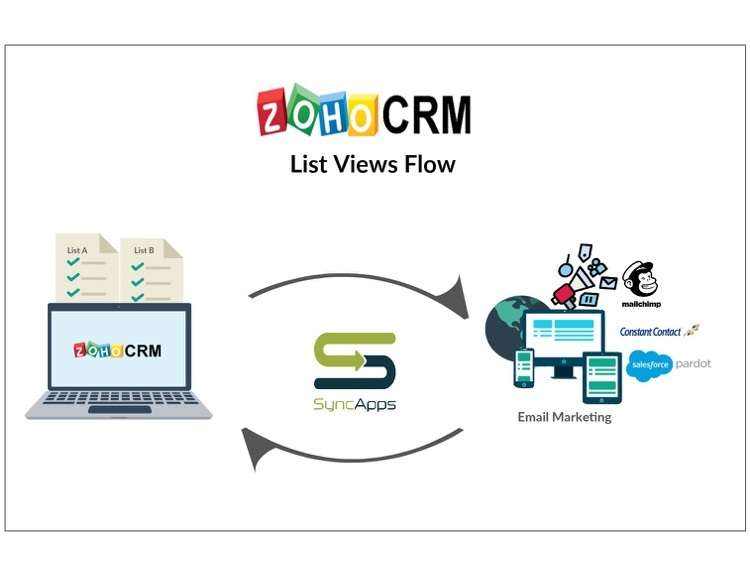 What are Zoho CRM List Views? A List View is a grouping of records based on a defined set of criteria. List Views are beneficial for displaying customer specific data according to your business requirements. 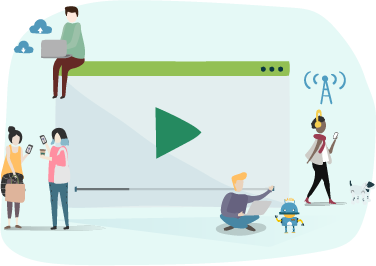 Now imagine all of your List Views in Zoho CRM available to sync to the likes of Mailchimp Groups or Segments, Constant Contact Lists, Pardot, and many others! SyncApps now has List Views feature rolled out! For example, you may be interested in following up on the leads created during the last week or review overdue tasks, or you may want to filter out big deals. The best way to handle these scenarios is to filter the records using the list views. You can also use the List Views for changing record owners, deleting records in bulk and sending mass emails. Zoho CRM provides a set of Standard list views that are ready to be used by all the users in your organization. In addition, you can also create list views and share with colleagues in your organization. Standard List Views: You can modify the standard views and sort the order of the columns in the list. You cannot delete these list views. Custom List Views: You can create, modify and delete the custom views and you can also sort the order of the columns in the list. List views are categorized under Created By Me and Shared With Me. You can also mark list views that you often use as Favorites, and those will be listed first in the List View drop-down. Just tap the Star next to a list view, and it will be available under Favorites. 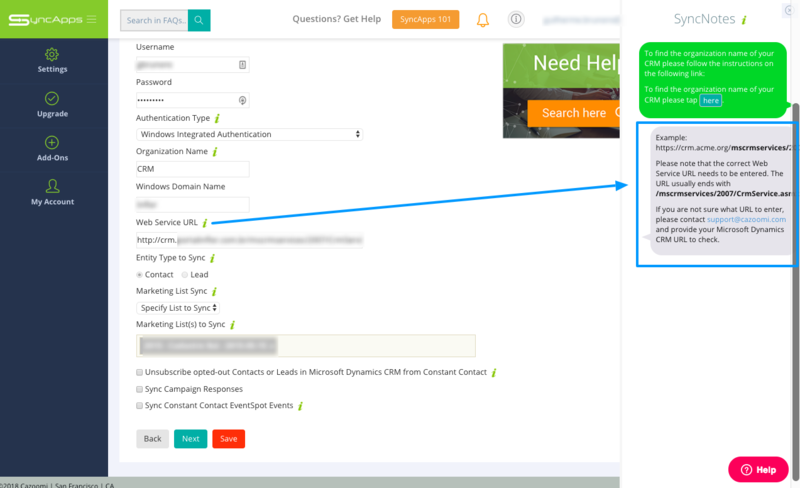 Are you using Zoho CRM Tag(s)? Zoho CRM is not quite prime time yet with their Tags API yet when they release it we will support it. How does it work with SyncApps? In Step 1 of your Sync Profile, you will need to select "Sync Specific List Views" under the Sync Mode feature. 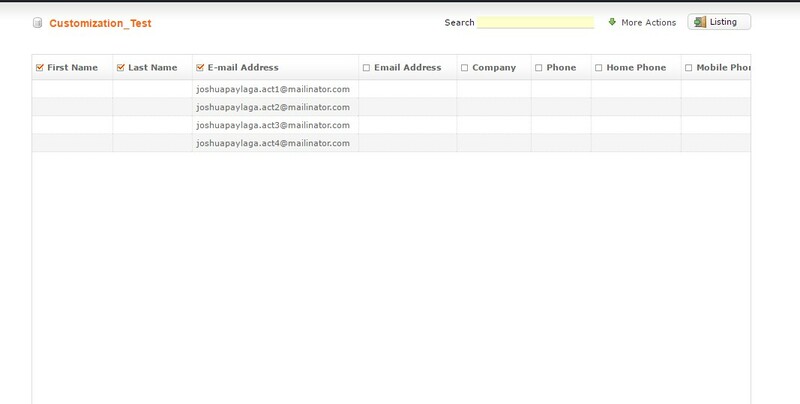 This will then create a Group/Segment or List under your specified Master List, Audience in Step 2 of the Sync Profile. Please note that only the records under this Specific List View(s) will be synced to your marketing automation solution. If wanting to sync all the List Views then just leave all the checkboxes inside of the pop-up menu for the Sync Specific List Views unchecked. Then tap "Sync Now," or if you have finished updating your Sync Profile configuration, then you have to finally, Reset Sync Process and Resync. Constant Contact subscribers are limited to only the 15 Custom Fields allowed on V2 API of Constant Contact. Once V3 API of Constant Contact is released with all features like Email Campaign functionality we will support their new 25 custom field limit instead of the 15 preset custom field current limitation. If you are here then you’ve probably been having a bit of trouble setting up your own Sync Profile with SyncApps, right? Granted, the process does seem a bit tricky, but with the right guidance, it really can be a walk in the park. So stick around and let us walk you through this painless process. Which custom fields created in Constant Contact do not show up over in SyncApps Constant Contact Field list even after refreshing fields. How to see the Constant Contact custom fields in the additional field mapping while trying to map custom fields in both systems. This could be giving you problems even after refreshing so that the newly created fields do not show up. What to do when Fields are being displayed with Standard Naming in Cazoomi (custom_field_1-- custom_field_15) but not with the name you used to create in Constant Contact. 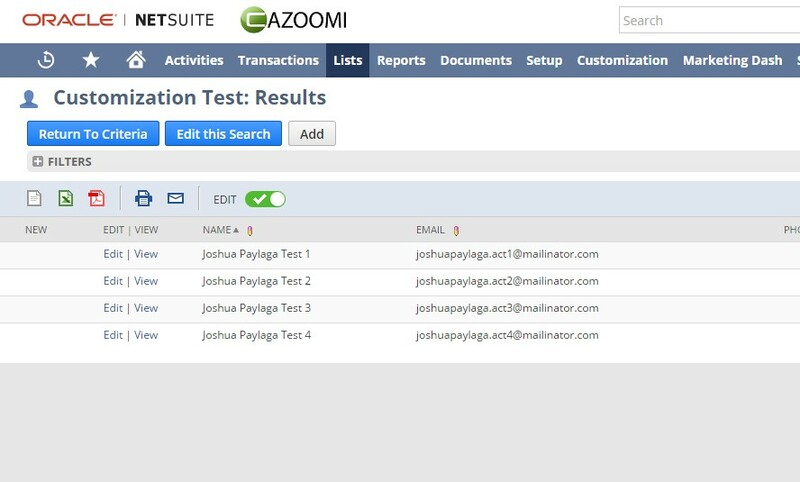 What to do when a Custom Date Field you named "Subscribed Date" in Constant Contact is not available in the Cazoomi Field Mapping Section to map it to Salesforce. Well, we heard you, and we’ve got answers to these questions and more. Don’t worry; it’s really not that complicated. We want to take you through a step-by-step process. Trust me; it’s going to be a breeze after this. Let’s start off with looking at the pre-mapped fields from to Constant Contact below shown in blue. The red #7 field is how Custom Fields 1-15 will be shown when designated which we will explain coming up. For Custom Fields let’s start off with mapping back Bounce Reason and Bounce Date to CRM. You can do this in Step 4 as Text Field Typed and Date Type using an existing field. Note: Sync Campaign Response must be selected in Step 1 in order for these fields to be available for Field Mapping. Try changing your field on the Salesforce side to a Text field to capture "Bounce Reason" which is text type in Constant Contact. 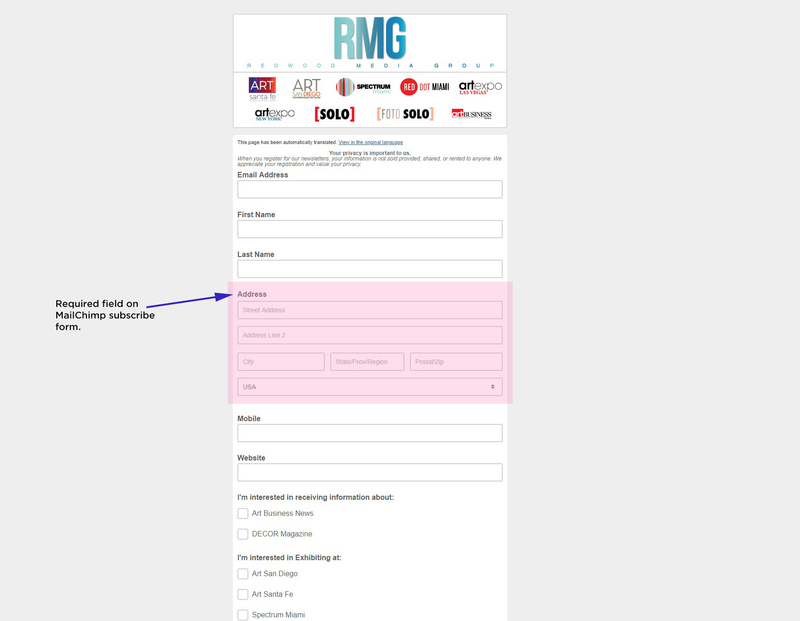 Do you prefer to use a Custom Unsubscribe field in CRM? If you do, then that’s fine, just use our Add-On just for this feature in your Add-Ons tab and once subscribed it will instantly turn this feature on to map in Step 4 today. Simple, right? You can also choose to do Additional field mapping or not. We’ve made it easy for you by mapping the Basic Contact fields including Email Address, Name, Address, Company Name, and Phone. Do you wish to use Custom Fields in Constant Contact? No worries, we’ve got you covered! Listen to this - 15 custom fields for you to choose from! Now that’s a whole lot to choose from, which is great. However, if you choose to add a custom field in Constant Contact, it will not add any functionality to the 15 already available Custom Fields that the current constant Contact API allows. In Constant Contact, only 15 Custom Fields are allowed. However, it’s not all gloom and doom for those willing to add since you can map the 15 fields to match your fields in CRM. When doing all this, make sure you jot each field label (COMM STEM = Custom Field 1) down to be used in your Sync Profile. 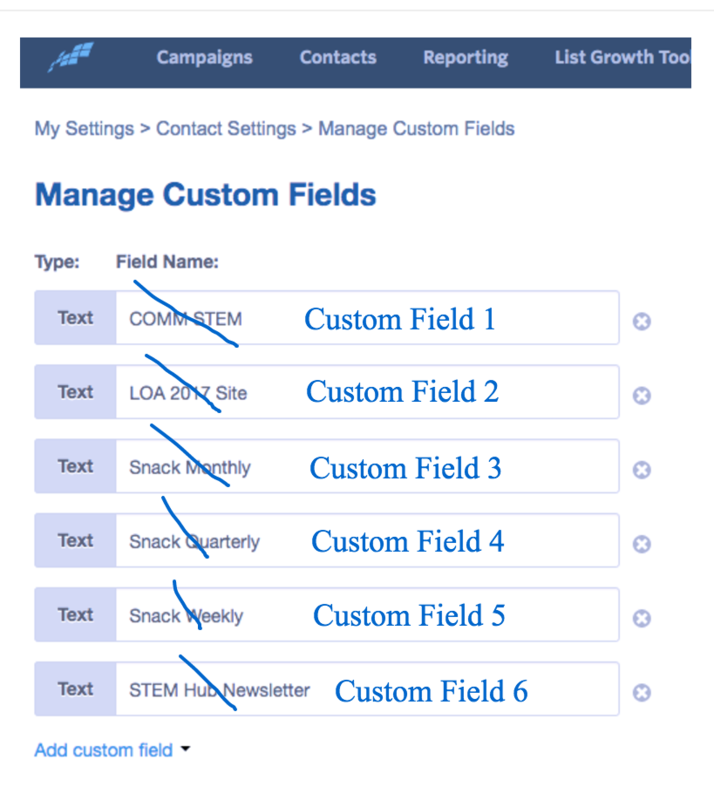 This will help map the 1-15 custom fields available to your CRM field(s). You will need them as Constant Contact only supports the naming of custom fields 1-15 as shown above. Birthday is also not a standard field available in Constant Contact v2 API for the Contact (https://developer.constantcontact.com/docs/contacts-api/contacts-resource.html) and is not synced by default. However, the v3.0 API https://v3.developer.constantcontact.com/api_guide/index.html will include these fields and also many more features. The V3 API now supports the birthday and anniversary properties in the contact object. This means integration users can take advantage of autoresponder messages to send birthday and anniversary email campaigns. Once it is live and available for SyncApps you will be able to map Birthday field. Did we answer your question? I hope we did. Have you tried setting up your own Sync Profile with SyncApps? Let us know if you hit any more snags by emailing us at support@cazoomi.com. We are ready 24/7 to answer all your questions. To map CRM Address and Mailchimp Address fields, there are two ways to go about it based on company preference. 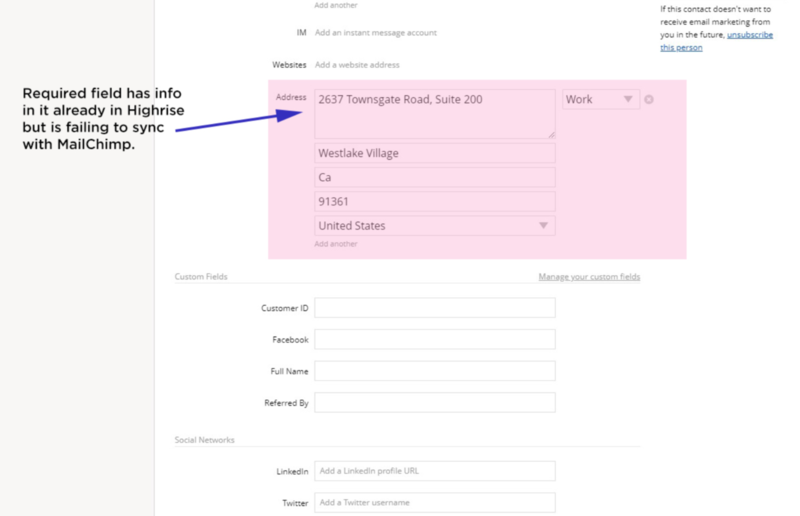 If using Mailchimp Address Data Type fields, please follow the rules below as Mailchimp Address Fields all need to be mapped for CRM data to flow to the Mailchimp Address. If one field is incorrect, then the whole record will fail to sync to Mailchimp as per their API rules. So you need to use the following mapping: Field label and type are important here. 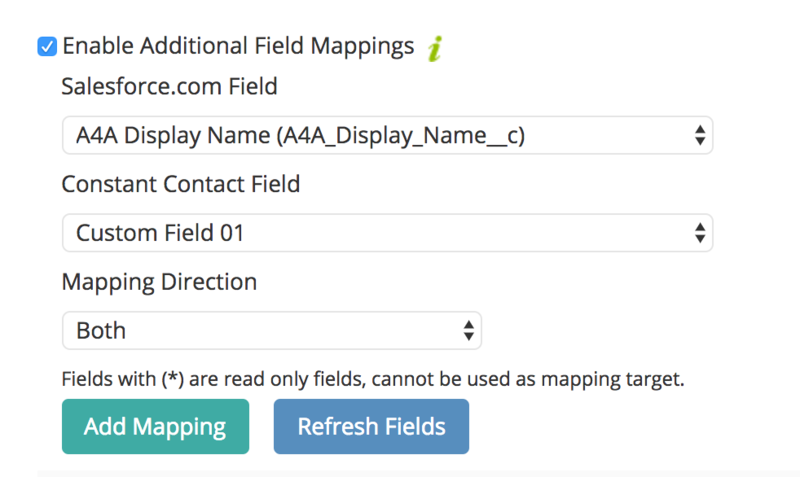 The 5 fields above mapping rules are only applied if you are using Address Data Type fields in Mailchimp. If you use a text data type field, then the above rule is not applicable and Mailchimp Address rules apply. Please see here for Mailchimp address rules. 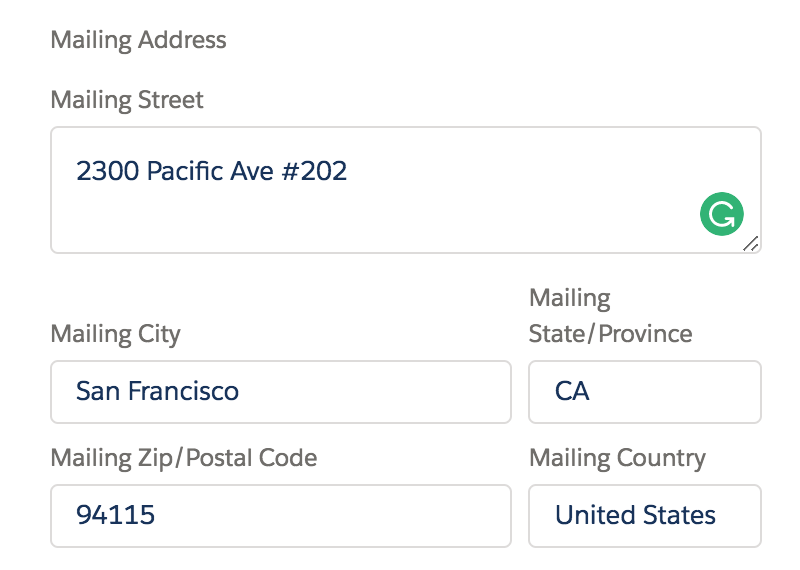 Mailchimp Address fields are quite strict so best practice is to use a text field for each address component for the 5 merge text fields for street, city, state, zip, and country. 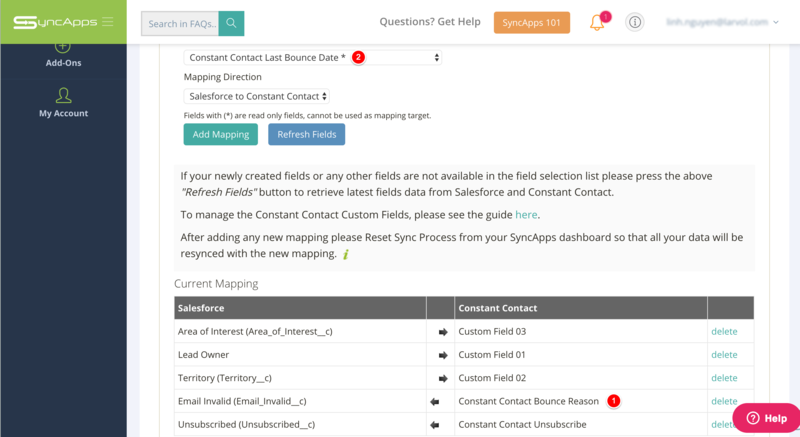 If you're needing subscribers to be able to update their existing address in CRM from Mailchimp then after mapping the fields just select in Step 2 of the Sync Profile this feature below. 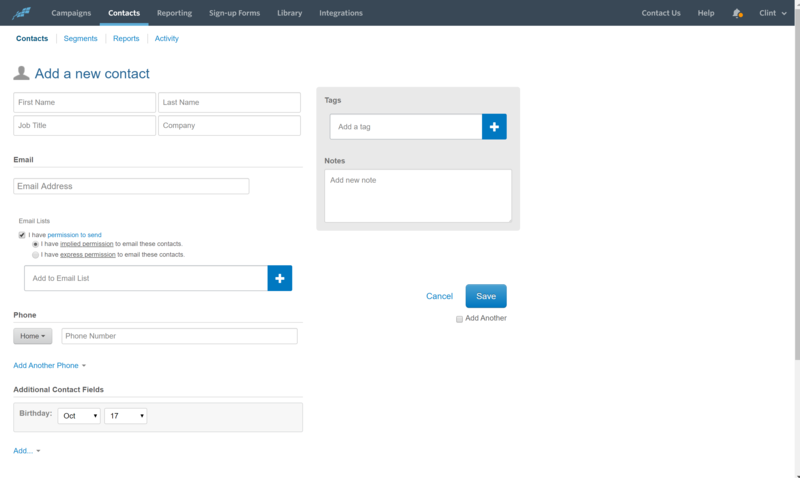 Mailchimp Update Profile Form is used to accomplish updating CRM records with changed fields. This will use mapping configuration to update data. Please make sure you configure the mapping correctly. A webhook will be set up in the specified Mailchimp Audience by SyncApps if this option is enabled. 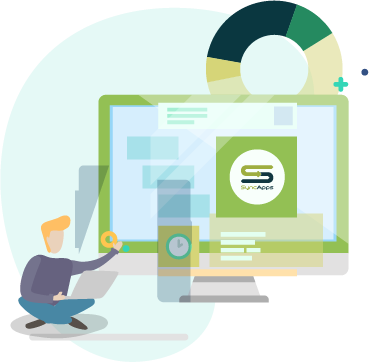 Sync Campaign Response means that we will bring back the metrics to CRM from your Marketing Automation solution such as opens, clicks, bounces, forwards, and clicked links from any marketing sent to the List named in Step 2 of your integration. Note: Mailchimp API does not have an efficient way to update for "Sent" in the Campaign Member Status for Automation Campaigns (not regular Email Campaigns) as Mailchimp does not give timestamp when the actual sending is done. This status is not always 100% exact. 5 Types of Campaign Response, or Marketing Metrics to choose from! This option will create a Campaign in Salesforce from your Marketing Automation solution with the Campaign Members in it together with the individual Campaign Metrics. See the fields we create and layouts needed to place each on here. 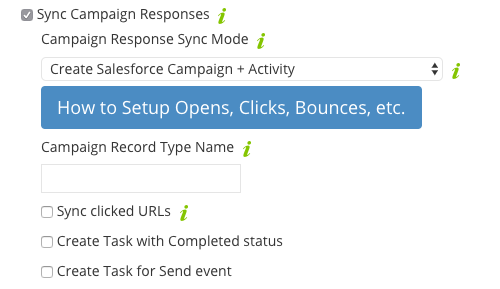 If this option is selected then each event such as Opening, Clicking will create a new Activity (Task) in Salesforce. Also, an option for tracking URLs clicked and sent the event as Tasks. By default clicked URL is synced to the activity description field. 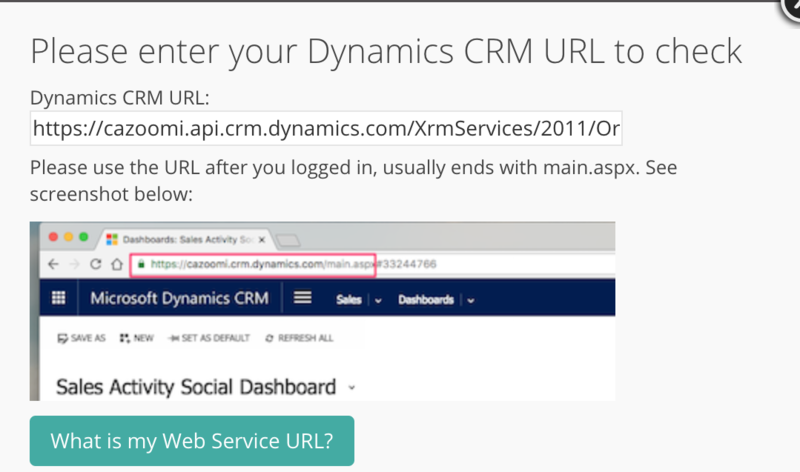 If you need to sync it to a specific custom field say, for example, "Clicked URL" you will need to create a new Task/Activity custom field and map it in SyncApps. If using this option then no extra field placement is needed. We will sync back your Email Campaign(s) to Salesforce Notes and in addition, add an attachment of the Email sent to Leads and Contacts. 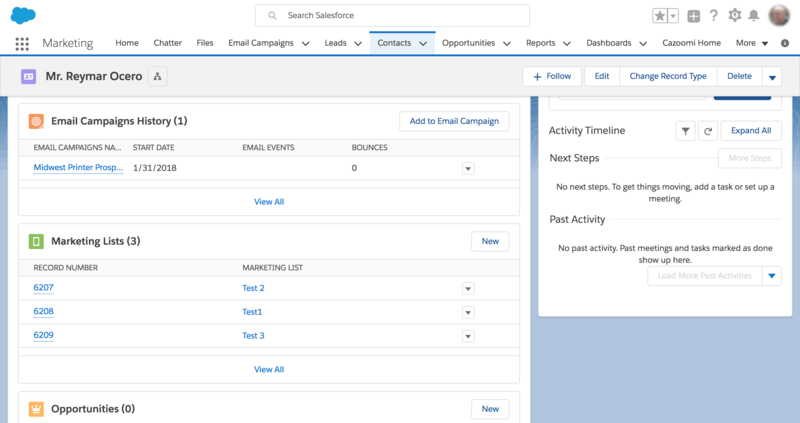 This Option will create a Campaign in Salesforce from your Marketing Automation that has the total number of Campaign Metrics from a specific Campaign. This will not sync Campaign Members. To setup fields to see the total number of Campaign Metrics or the Summary please see this article linked. 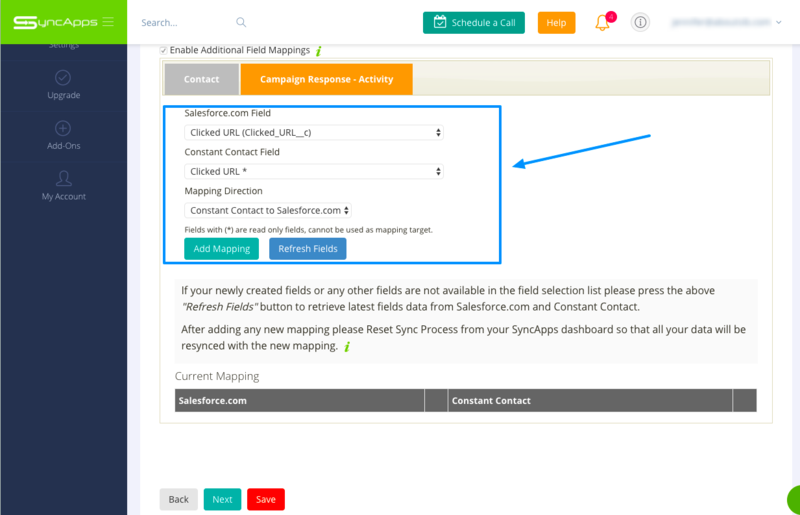 After selecting the preferred Campaign Response Sync Mode in Step 1 of the Sync Profile, next, you can map the totals for the Campaign Response fields in Step 4 for the Campaigns you send out back to Salesforce. 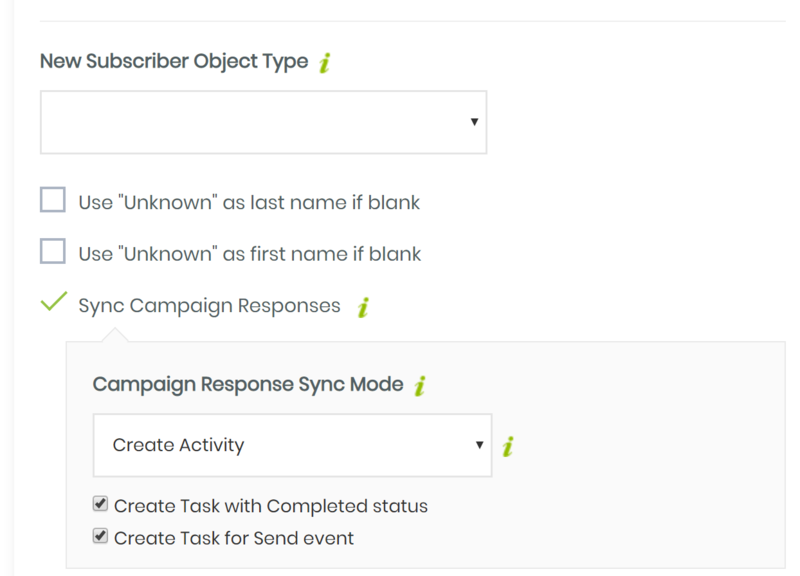 Please note that the Campaign tab fields may vary based on the chosen Sync Mode selected in Step 1. Enhancements to large volume data processing, lead score & custom field mapping retrieval, has been built into Cazoomi Marketing List. The enhancements to large volume data processing allow our large list of subscribers to quickly move lists from Salesforce to their Marketing Automation solution of choice more efficiently. Add/Remove feature enhancements for Campaign/List membership in CRM to Marketing Automation Lists/Groups/Categories. This enhancement adds SyncApps add/remove features with the use of Salesforce Campaigns to your Marketing Automation solution of choice. 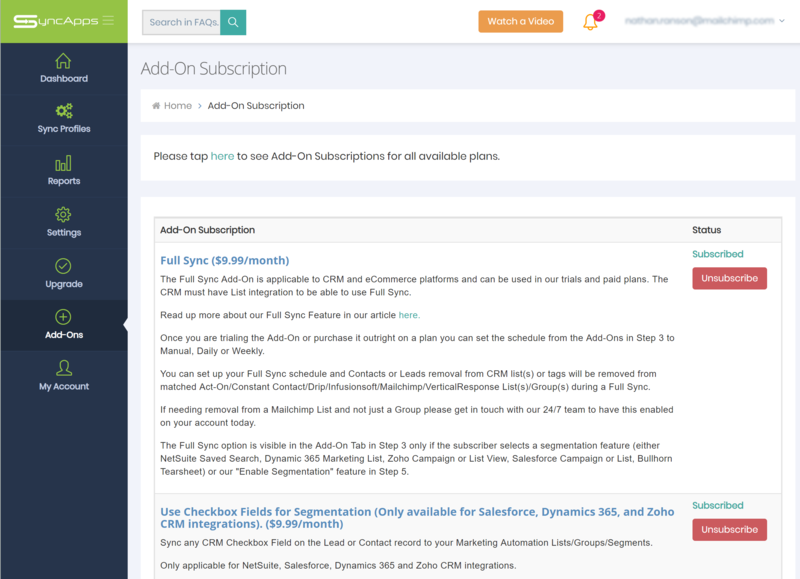 If using Salesforce Campaigns, you can now automatically manage if a subscriber is added/removed in your Marketing Automation Lists/Groups/Categories back to Salesforce Campaigns or a Cazoomi Marketing List. Only Campaigns selected in a Sync Profile (if using Campaign as List feature) will be tracked in the Campaign Member History object. Previously all Campaign Members removal are recorded so caused some storage issues. Fixed error when searching for contacts/leads using Boolean field criteria. I've just upgraded my account to the Basic Plan, monthly so that I can schedule automatic syncs, but I'm having trouble. It still won't let me schedule the syncs. Suggestions? You just need to edit your Sync Profile and tap "Sync Scheduling." For our Basic plan, the available schedule is every 24 hours so you can only choose which time you want to sync to be run. Need more control over your scheduling options? Try our Professional or Enterprise plans which allow up to real-time scheduling. To upgrade please see your "Upgrade" tab when logged into your SyncApps dashboard. What level of permissions does my NetSuite role or integration user need? Any challenges with your NetSuite integration and sync procedures when it comes to permissions? 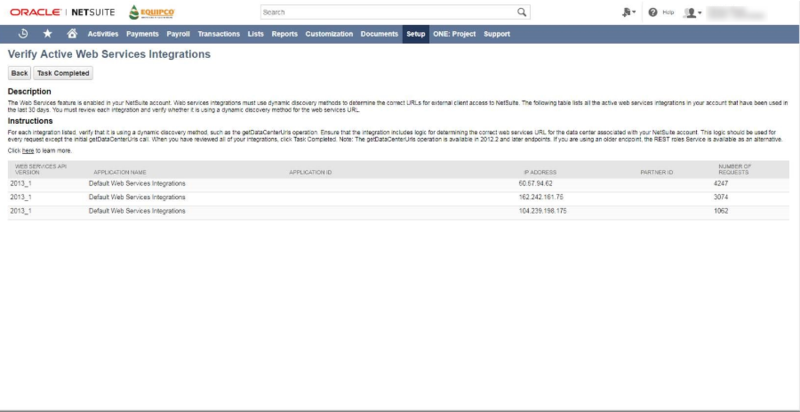 Be sure to check out the latest NetSuite Permissions XLS attached to this article to review each if you get errors in the integration which state you need specific permissions for a role or person. What level of permission does this account need? It does not update customer/contact/transaction info, so I assume view only for those records is fine. For case records probably edit permission? If I am going to use the Enterprise plan and need to integrate Salesforce for NetSuite too what permissions do I need to add? NetSuite will not allow using Administrator/Full access role for API starting 2019.1 but still allow the use of a custom role with Full permissions on some objects (Contacts, Customers, etc.). Please assign the following permissions (Full) to the NetSuite Custom Role. Do note that after adding new permissions in NetSuite they can take up to 24 hours to take effect. Please continue scrolling down, you might have other integrations with SyncApps and might need to permit more lists. For Handshake SyncApps "Standard Customer Form" should be enabled for NetSuite role that is used for SyncApps connection. SyncApps uses standard form only for updating Handshake external id field so the Standard Form should not be disabled. You can always use a custom form as your preferred form as in NetSuite you can have more than one enabled forms. Also, SyncApps will not integrate NetSuite inactive or Soft Opt-Out records. Do you have custom fields to map between NetSuite & Zendesk? Additional Field Mapping is optional in your Sync Profile as basic ticket fields such as subject, description, type, status, priority is already mapped. Try out in edit mode in your Sync Profile in step 4 which is Field Mapping. If you happen to get an error like below, then please add 'Custom Event Fields' permission to your NetSuite record to get around this hurdle. 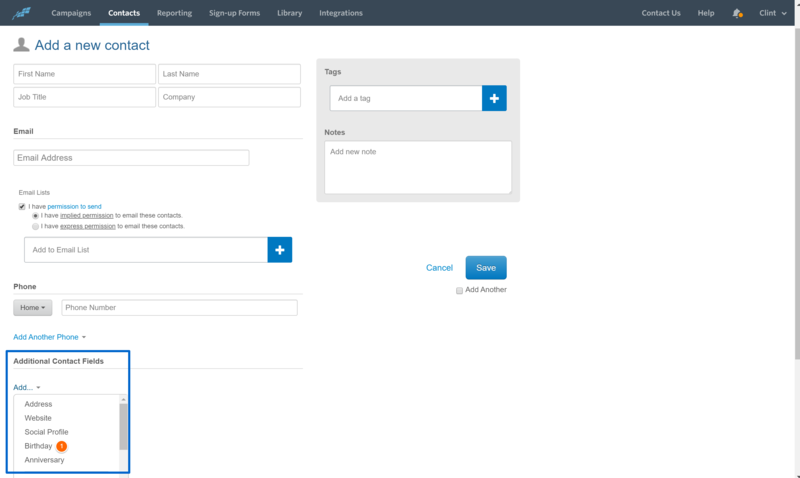 Need NetSuite Customer to Zendesk Organization fields to map over? The saved search object type in the configuration must match object type of the saved search object Type in NetSuite; otherwise, you will get invalid saved search error. In the saved search definition, please make sure the "Public" checkbox is checked and "Available as List View " is unchecked for the specified saved search. Please also change the saved search owner to the NetSuite username used in your SyncApps setup on Cazoomi. Please try to run the sync to see if it works, if the error still persists, please proceed with next steps. Please assign NetSuite "Publish Search” global permission to the username that is used in SyncApps then try to re-run the sync after the permission is assigned. If the NetSuite user configured in SyncApps has more than one role, please set the default role to be used for web service. 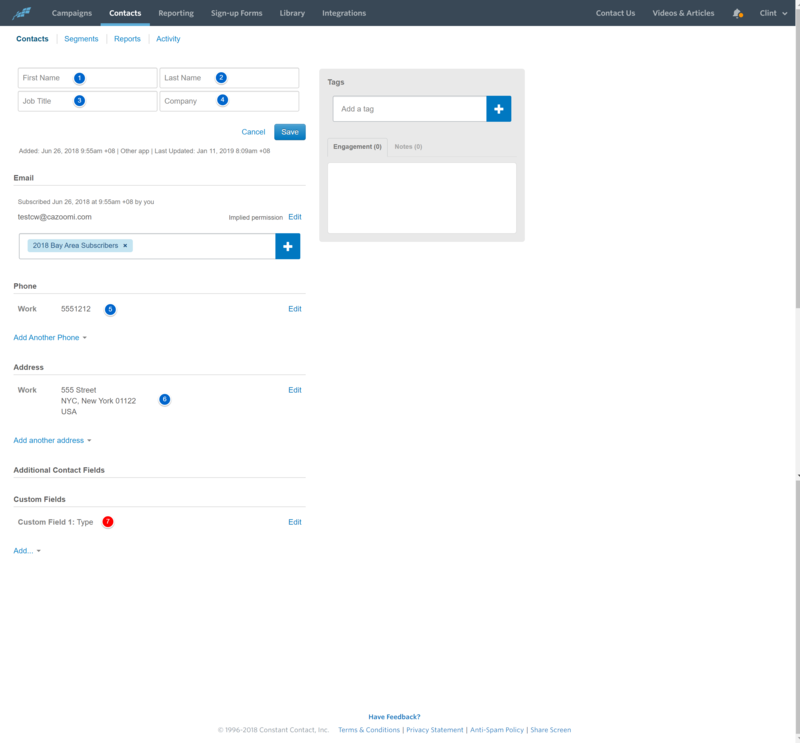 The role to be used should have access to saved searches custom fields, customers, contact objects. If you still get the same error, please try to recreate a new saved search based on the current saved search in your NetSuite account. You can also try to use another NetSuite username to test. Please add "Employee Record" permission. The Employee Record permission is a part of the Advanced Employee Permissions Enhancements for release 2018.1. The Employee Record permission replaces the Employee Search and Employee Navigation permissions introduced in NetSuite 2017.2. 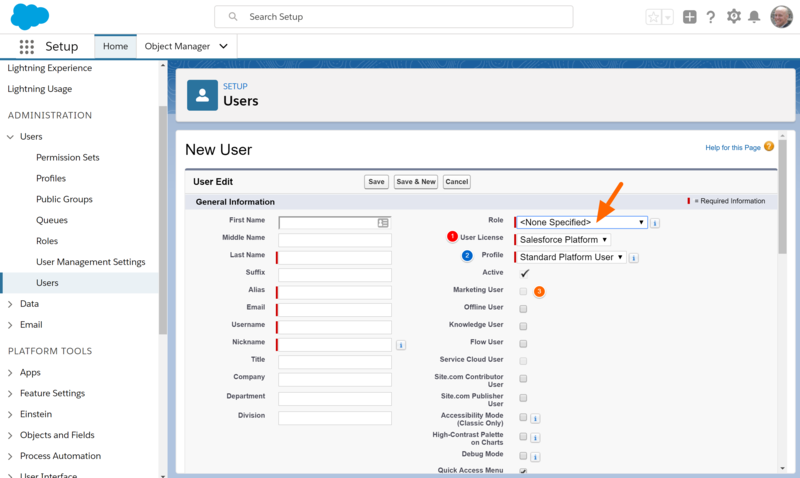 Roles assigned with this permission, in combination with an employee specific permission, can search for employees and see employee menus (List > Employees) within NetSuite. Note: Adding permissions to a NetSuite role might not apply immediately so to remove the permission cache you will need to remove the role from the NetSuite user. Next, save the user then re-add the NetSuite role permission again. Hope our support was helpful as we strive to provide the best subscriber experience in all integrations. Feel free to reach us 24/7 here. Act-On for Zoho CRM combines the wildly popular Zoho CRM with a fast growing marketing automation company, Act-On. 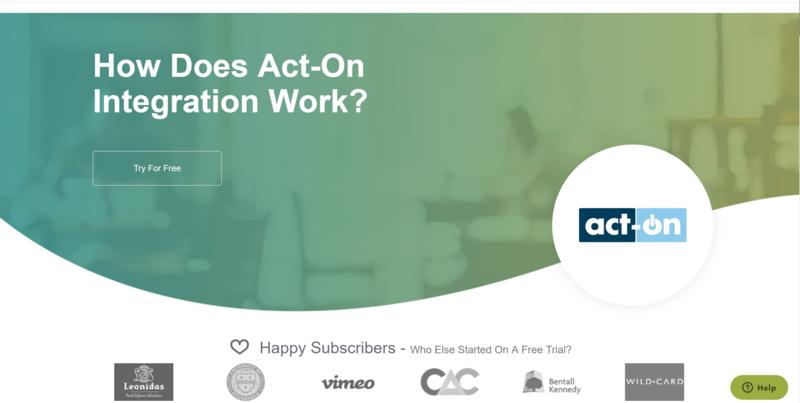 You can automate the interactions with your site visitors, email marketing fans and give your small business an edge with Act-On. View the guide inside our trial with over 10+ pages of notes to get started today. See how to integrate Act-On Lead Score back to CRM and Lead Status to NetSuite. Hi! Worried on why don't your records, Lists, information sync to Constant Contact from my CRM? 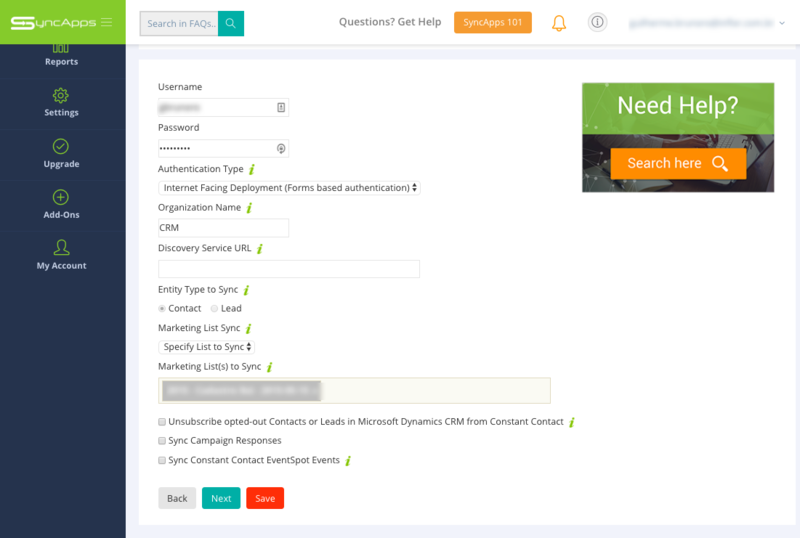 You will just need to reset your Sync Profile anytime you make changes to any Dynamic CRM Marketing List criteria. Please just press the "Reset Sync Process" & "Sync Now." Once the Sync is completed, you can check "Details" to review how the sync details turned out to verify all the lists and record information synced correctly to Constant Contact. Hi there, glad you could join us today! We’ve received tons of questions about Microsoft Dynamics and Dynamics 365, and we thought it’s time we simplified these two platforms for you in terms of integration. 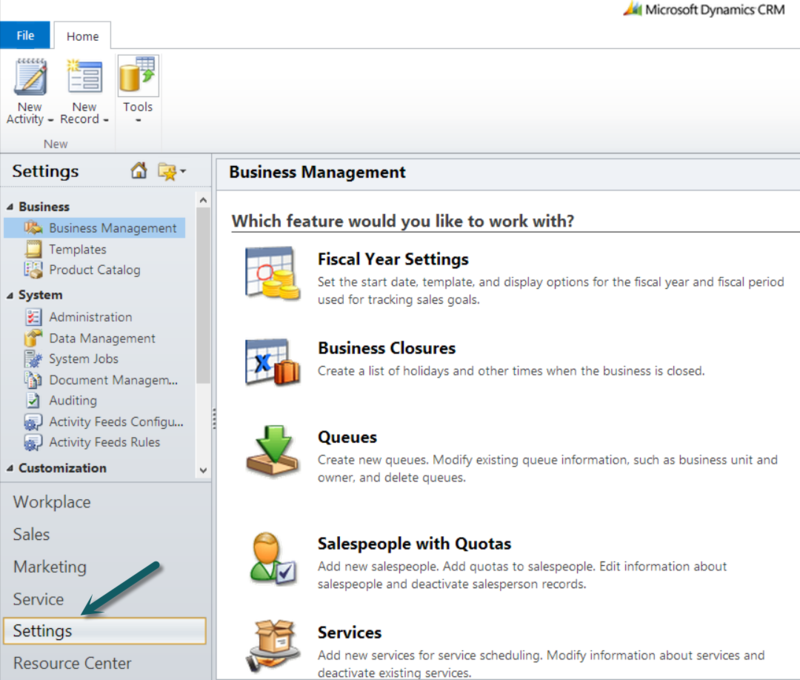 SyncApps only supports Dynamics CRM Online and ADFS authentication currently. Dynamics 365 Enterprise SyncApps versions for 2013/2015.2016 only supports Active Directory Federation Service (ADFS) authentication for on-premise CRM currently. Expose your CRM server to the internet so that SyncApps can access it. Ask your IT team to expose your server to the public internet if you are using an internal facing CRM server. You will be able to use our SyncApps.